Another week when I wondered if I would have chance to take photos of anything other than school. One week left until half term, which means there’s still plenty to keep me busy and my thoughts occupied, but I’ve also kept spotting signs that we’re having a pretty beautiful Autumn. All the details you need to participate in Sunday Sevens are set out over on Nat’s blog. 1. 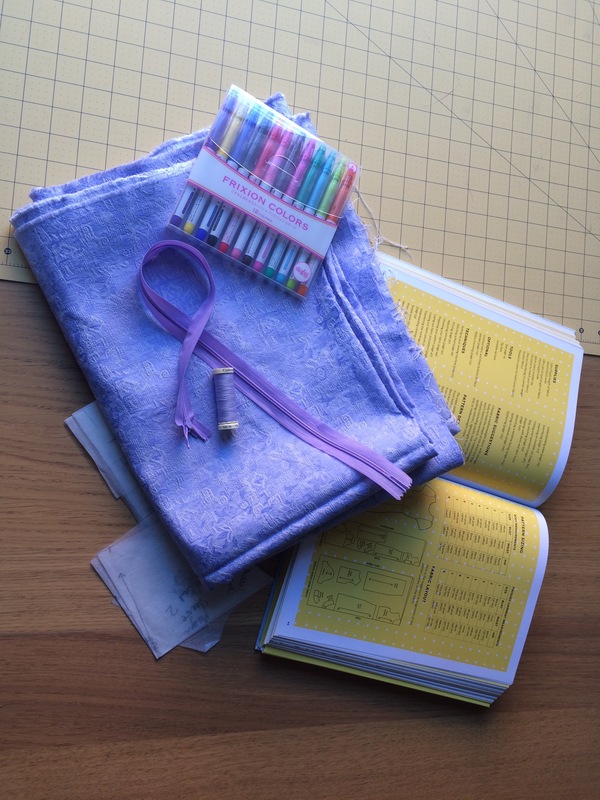 I’ve had this fabric and pattern combination in mind for a while, so last Sunday I got all of my supplies together, and promptly left them in a pile. 2. 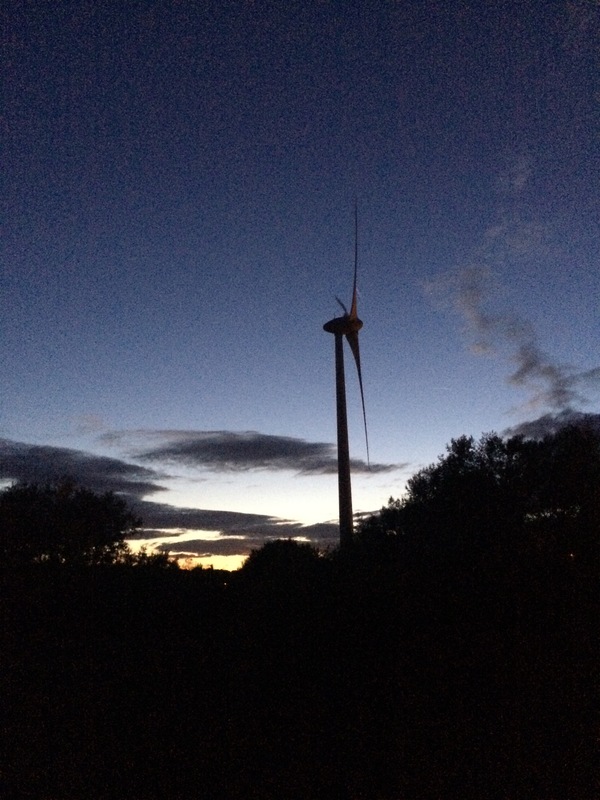 There have been some more beautiful autumnal days this week, I took this on a clear evening just after sunset whilst out with the dogs. 3. 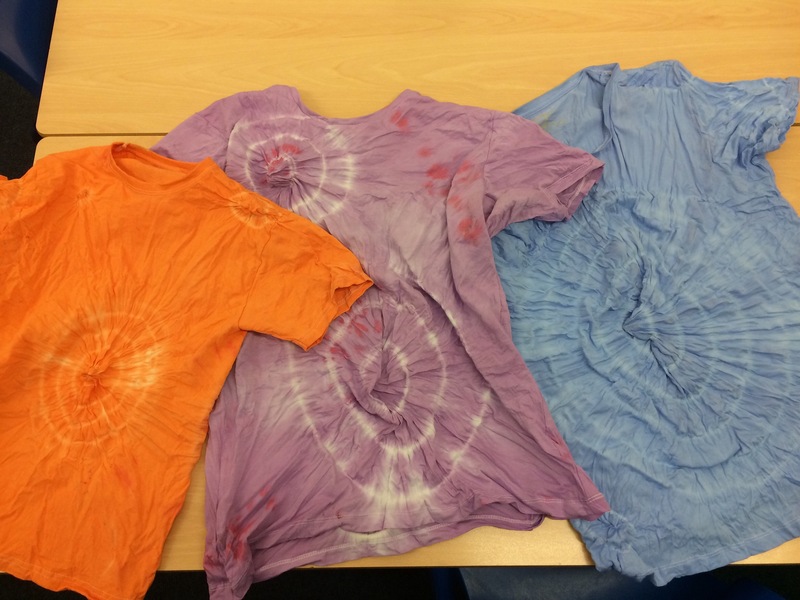 As requested, a couple of the tshirts dyed by Year 6 children. 4. We had a pizza party at school! 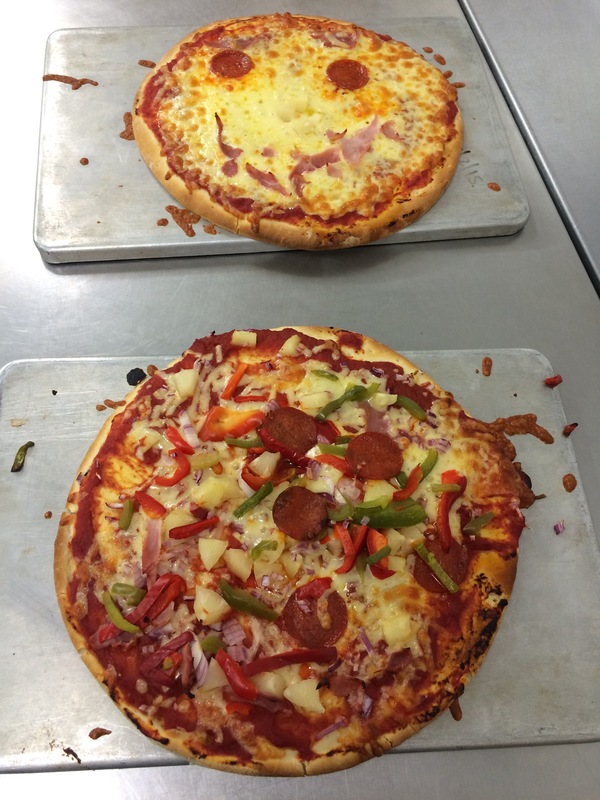 Children came back to school 6-7.30pm to make pizzas with spooky faces and then blog about them. 5. I spent a day with my mum and dad. 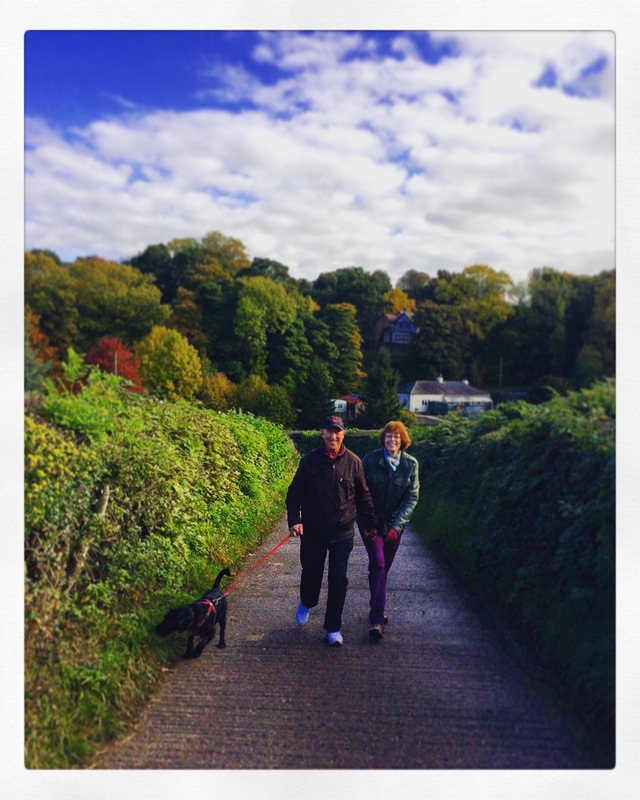 We walked the dogs together and admired the changing leaves. Less poetically, shortly after this picture was taken Wilfie sniffed out some fox poo. If you’re familiar with terriers you’ll no doubt understand why he was in the bath as soon as we got home. 6. A borrowed photo! I bought 2 orange lantern plants from the garden centre where we had coffee and scones. 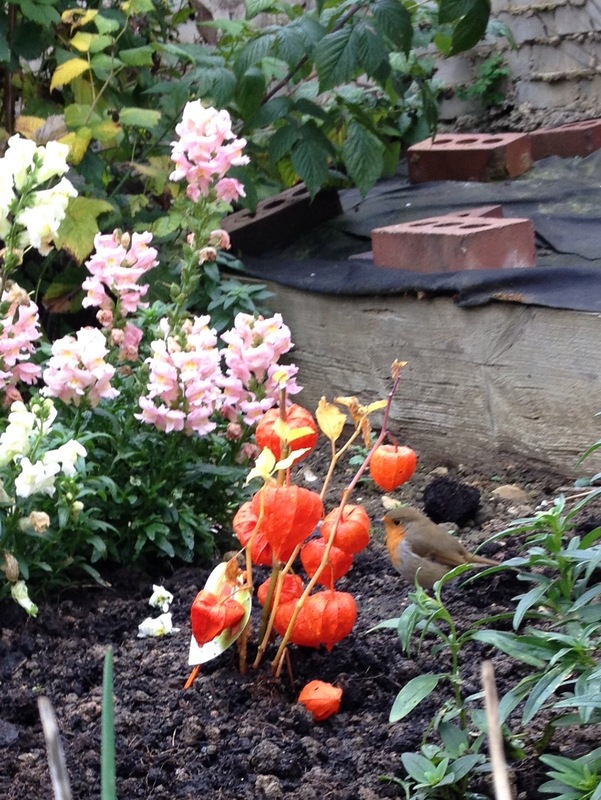 My mum planted hers straight away and sent me this to show me the robin approved. 7. New nails! 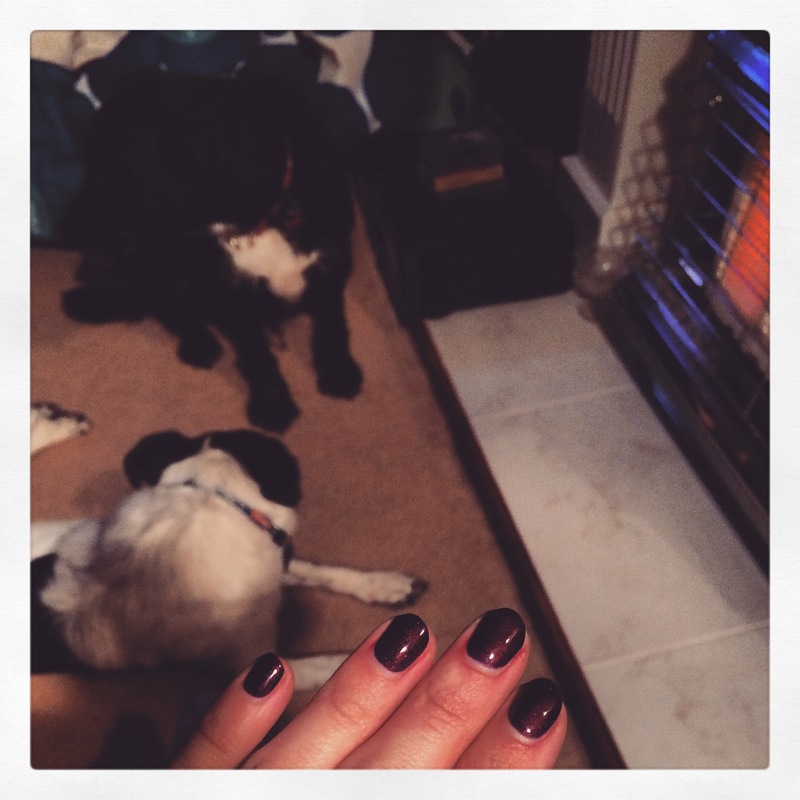 I treated myself to a manicure – the first time I’ve ever had my nails done! I decided I should fritter away at least some of what I’ve not spent due to my pledge, and this seemed as good a way as any. The last week of the half term includes parent consultations, training and a meeting or two. In between, I’ll be doing my best to keep walking and admiring Autumn at every opportunity. Have a lovely week. The multicolours are nice for different fabrics, just from eBay and think they were pretty cheap! The pile of stuff is destined to be a Megan, one day! Only one more week to go, they get busier and busier! Lovely nails and was that a Megan I spotted? Sounds like a lovely family and school week. Hope Wilfie doesn’t scout out fox poo too often. Lovely pics, as always–I love the one with the robin! And I’ve decided to go back to school–YOUR school. 😉 Absolutely agree that you should treat yourself and enjoy the autumn while it’s here; it’s so nice but so short! Thank you! The Robin is very sweet although snapped quickly on a phone so not very focused! Lovely colours though I think 🙂 I agree, would be lovely if Autumn hung around for a while longer. Your school is so cool. Is that a whole rainbow pack of fixion pens?! Omg never seen that! I have black, red and blue. I need these!! Aaaawww love the photo of your Mum & Dad – say hello for me 🙂 Your nails look gorgeous and I can’t wait to see what you are making with the lilac fabric! You know how rare it is for my mum & dad to even be in the same place, never mind pose for a photo! My dress will hopefully, one day, eventually become a Megan. Those dyed shirts look great! Can’t wait to see what you are going to be making!